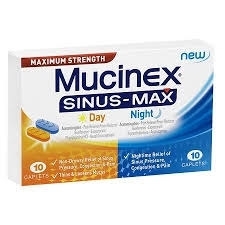 Mucinex Sinus-Max Pack Includes: Mucinex Sinus-Max Day Caplets - Has a triple action formula with three maximum strength* medicines that: Relieve sinus pressure and congestion, relieve headache, and thin and loosen mucus. Mucinex Sinus-Max Night Caplets - Works to: Relieve sinus pressure and congestion, relieve headache, relieve runny nose and relieve sneezing. Mucinex® Sinus-Max® Day/Night has the power you need to fight your worst daytime and night time symptoms. Do not take more than directed. Do not take more than 12 caplets in any 24-hour period. Adults and children 12 years and older: Take 2 caplets every 4 hours. Children under 12 years of age: Do not use. Mucinex Sinus-Max Day Caplets: Active Ingredients: Acetaminophen (325mg, Pain Reliever), Guaifenesin (200mg, Expectorant), Phenylephrine HCI (5mg, Nasal decongestant). Inactive Ingredients: Croscarmellose Sodium, Crospovidone, FD&C Red 40 Aluminum Lake, FD&C Yellow 6 Aluminum Lake, Magnesium Stearate, Microcrystalline Cellulose, Polyethylene Glycol, Polyvinyl Alcohol, Povidone, Talc, Titanium Dioxide. Mucinex Sinus-Max Night Caplets: Active Ingredients: Acetaminophen (325mg, Pain Reliever), Diphenhydramine HCI (25mg, Antihistamine), Phenylephrine HCI (5mg, Nasal decongestant). Inactive Ingredients: Corn Starch, Croscarmellose Sodium, Crospovidone, FD&C Blue 1 Aluminum Lake, Hypromellose, Magnesium Stearate, Microcrystalline Cellulose, Polydextrose, Polyethylene Glycol, Povidone, Silicon Dioxide, Stearic Acid, Titanium Dioxide, Triacetin.